Since he hit rock-bottom and admitted he had contemplated suicide Emmanuel Eboue has been inundated by football fans wishing him well – and now former club Arsenal are set to become involved in a bid to help. Gunners cult hero Eboue revealed he had seriously considered taking his own life after financial mismanagement has left him penniless, with a bitter divorce meaning he has been estranged from his three children since the summer. But the North London side – who he played for between 2005 and 2011 – are set to examine ways they can support the popular Eboue. Sportsmail contacted the Premier League giants to ask if they had considered helping the 34-year-old after his former club Galatasaray announced they had offered him an academy coaching role in Turkey. 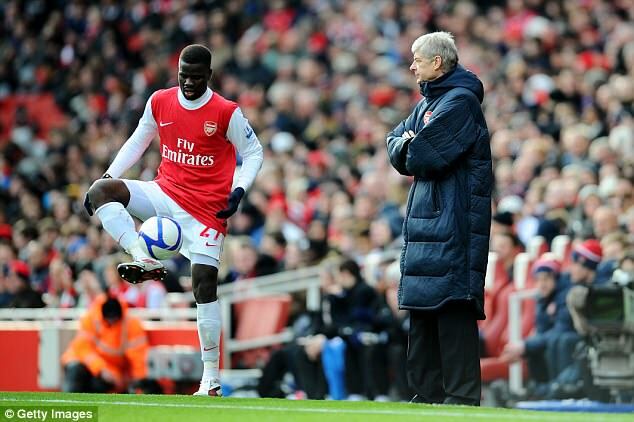 The news Arsenal are set to offer Eboue help will delight the former right-back – not to mention the club’s legions of supporters – after he said he had to sleep on a friend’s floor and barely has enough cash for an Oyster card. The world of football had been shocked to learn Eboue has hit hard times, not least because the Ivory Coast star who won 79 caps took home a seven-digit sum every year during his time in North London, earning a further £1.5 million annually playing for Galatasaray. But with help now appearing to be on its way from his beloved Arsenal, Eboue’s spirits will surely be raised – along with concerned football fans everywhere.